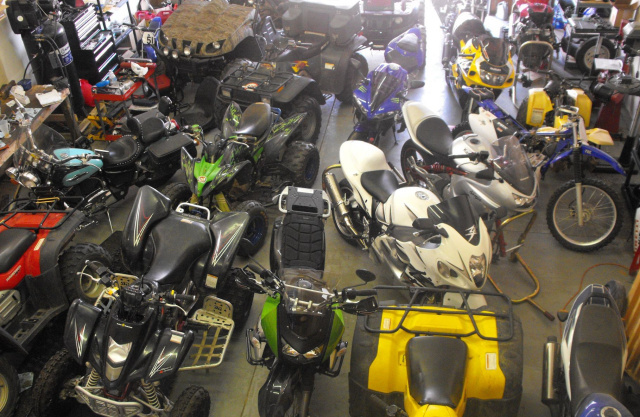 A professional, import motorcycle and ATV repair shop with experience in Yamaha, Honda, Kawasaki, and Suzuki. We are certified gold and five star by Yamaha Technical Academy. We are enthusiasts, who have been riding & racing for many years. We also sell parts, accessories and tires. FREE WITH ANY PURCHASE: K&N oil filter (KN-621) for select Arctic cat 06+. FREE WITH ANY PURCHASE: Emgo oil filter 10-82210 for select Honda or Kawasaki 82-01. Bridgestone T30 rear tire 170/60ZR17 $110.00! Jerseys: All Marshall dirt bike jerseys in stock are $12.97. Must mention you saw it on MIHPowersports.com to get these deals! FASTER PARTS! We now have many NON-OEM items available NEXT DAY! - If we don't already have it in stock. There is no charge for this service as long as the item is available in our local warehouse and is purchased before noon. We continue to increase the products we carry (inventory is over $40K). Suggestions are welcome. If there is something you would like to see, let us know. We accept Visa, MasterCard, Discover, American Express, and cash. Unfortunately, we can no longer accept checks.